A collection of key patents related to Scuba Diving, including the patent for the diving suit, breathing apparatus, helmets. Includes 4 separate framed and matted pieces of art for display on a large wall space. Choose either 11x14 or 16x20. Get 4 Framed & Matted Prints for the Price of 3! Overall frame size is 18-1/4" x 22-1/4"
Makes a great Scuba Diver wall art. 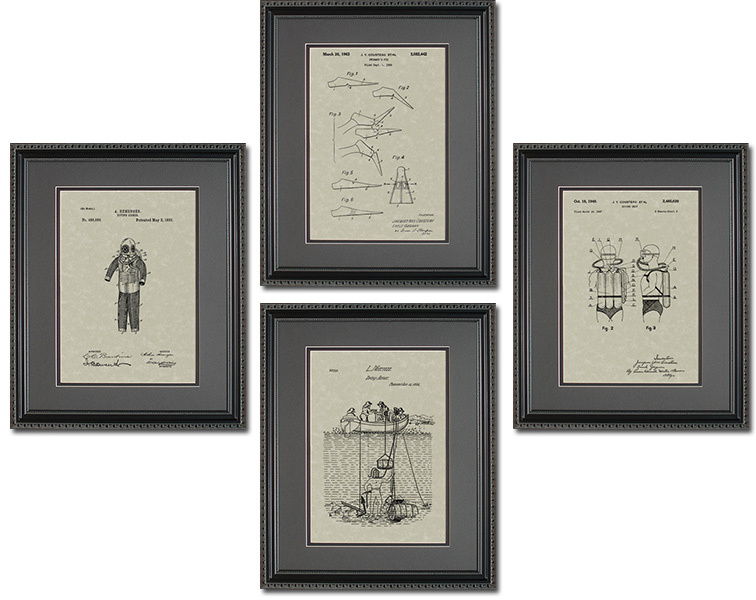 Four-count collection of key patents related to Scuba Diving. Size is 11x14 or 16x20. Makes a great Scuba Diver wall hanging.